Mark Oliver of Bonhams with the Lalique Alicante vase, estimate £20,000-30,000. Flowers, fauna and the female form – the trio of inspirations guiding the glassmaking hand of René Lalique – are well represented in a single-owner collection to be auctioned by Bonhams Knightsbridge. More than 200 lots collected over two decades by John Nemeth will go under the hammer on February 20 in a sale expected to total around £500,000. Every collection must start somewhere and Nemeth’s first foray into Lalique was to buy “a humble sparrow paperweight,” he recalls in the foreword to the Bonhams sale catalogue. The assemblage grew over 20 years to include car mascots, early vases, seals and paperweights. 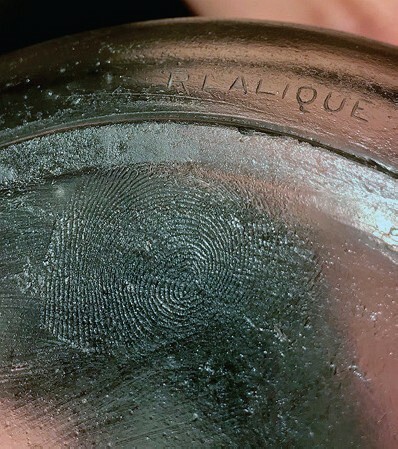 Several pieces possess the added cachet of having been displayed at France’s Musée Lalique while Lalique’s hand is represented in literal form too, in the shape of a thumbprint on the underside of a cire perdue vase. Bonhams specialist Mark Oliver deems the collection the “most important to have come to market in the past five years”. Oliver, a specialist since the early 1980s at Phillips and now Bonhams’ director of 20th century decorative arts, is well aware of the peaks and troughs in demand for Lalique. He can recall the crash in prices in 1989-90 when the avid Japanese collector base fell away at the start of that country’s economic crises. Indeed, Oliver’s team has handled queries on lots from Russia, the US and South Africa. Most are requests for condition reports – a key factor in Lalique pricing. 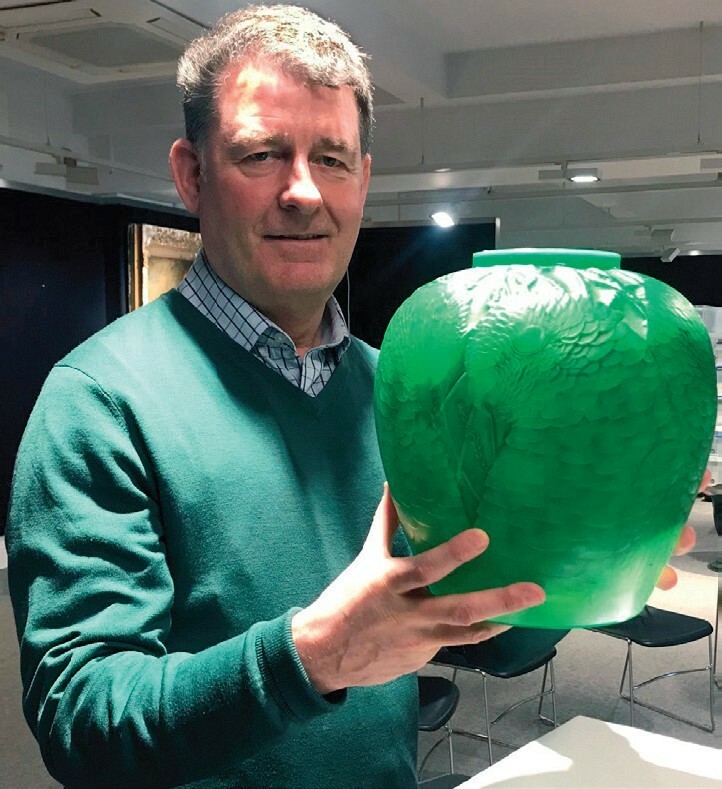 “A damaged vase rim can be reduced in width and height and this is something to be wary of when collectors are starting out,” says Oliver, who hopes the range of rarity and estimates will encourage those new collectors to bid. At the top end of expectations – £30,000-50,000 – is a rare Chrysis opalescent glass car mascot. So popular were car mascots that Lalique commissioned the Breves Gallery in Knightsbridge, once located a stone’s throw from Bonhams’ Montpelier Street offices, to supply them to British customers. Breves produced the chrome mounts into which the mascot was inserted, with a bulb to produce the light that is intrinsic to displaying Lalique glass. It’s clear Oliver has affection as well as admiration for this particular Lalique collection, not the first he has sold. Which of its 211 lots would he choose to buy himself, were that permitted? Without doubt, Oliver says, it would be the triple-cased, jade green Alicante parrot head vase (pictured above). 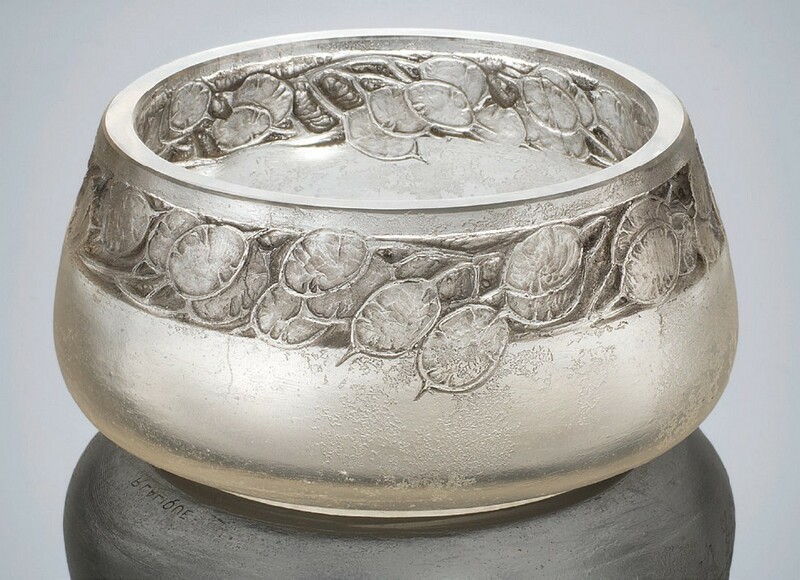 To read more about Lalique see our collecting guide. 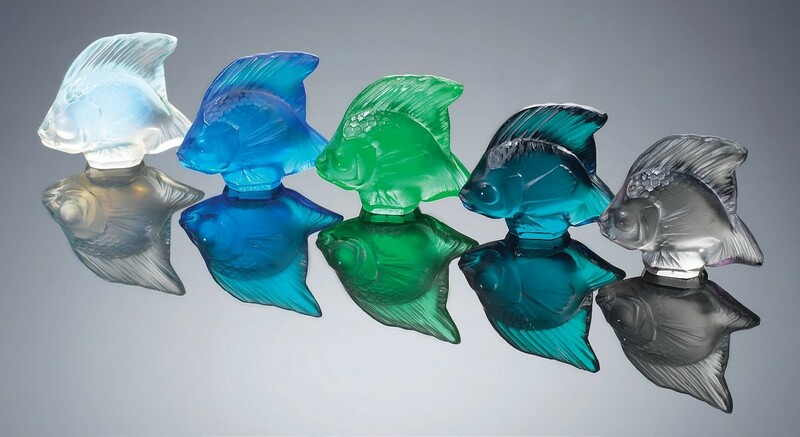 There are five 2in (5cm) Poisson seals in the sale, each in different coloured opalescent glass. Designed in 1913, the low estimate reflects the relatively large number produced, “perhaps 1000 or more of each one,” Oliver says. Together they show “the diversity of colour that René Lalique was using prior to the Second World War”. Lalique poisson seals - estimated at £100-150. Lalique double Marguerite sunflower paperweight estimated at £300-500. Of the 211 lots in the Bonhams sale, 34 are paperweights including two versions of the Double Marguerite sunflower model designed in 1919. 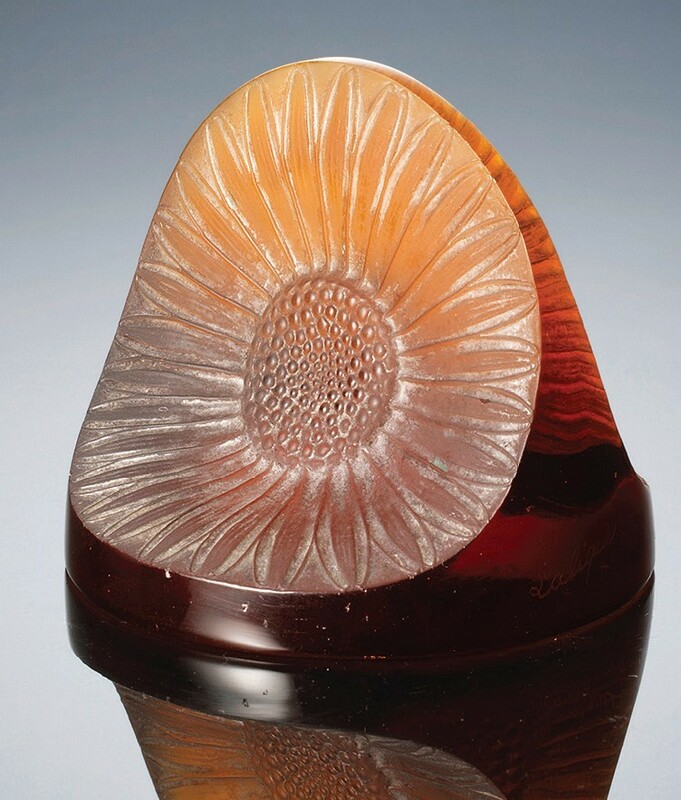 This pre-war casting made of dark amber glass is engraved R Lalique. 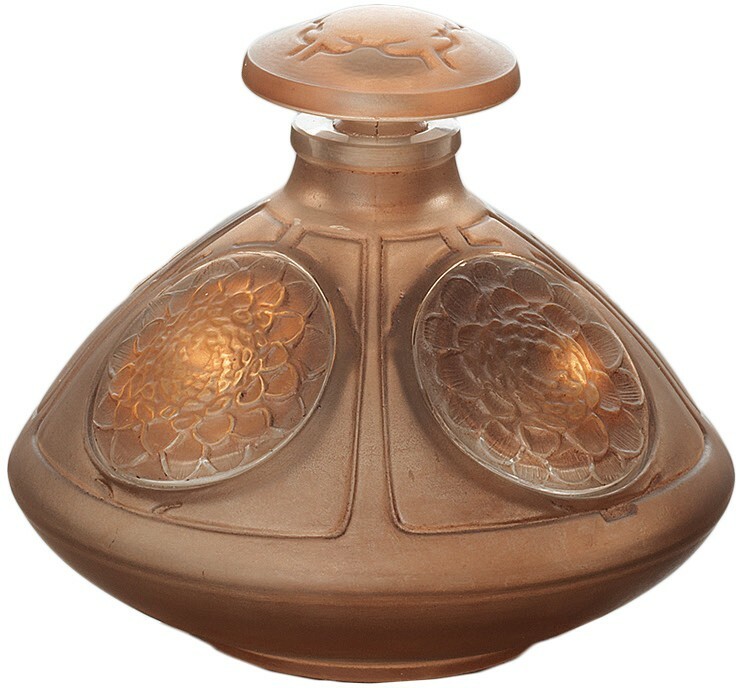 A post-war version, signed Lalique, is in amber glass with traces of white staining. 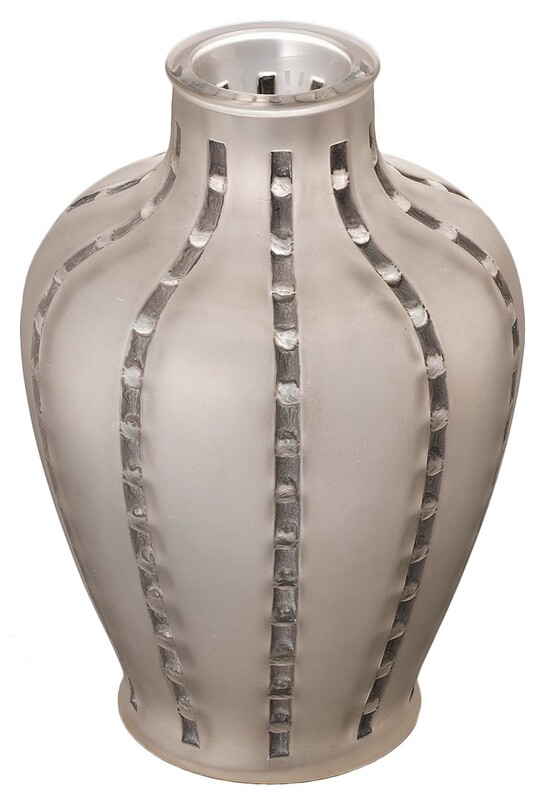 Mark Oliver describes two 11in (23cm) Bandes de Roses vases, designed in 1919 and produced up until 1945, as “entry level” pieces for vase collectors. This example, frosted with dark grey staining, has the intaglio signature Lalique. A Lalique 'Bandes de Roses' vase estimated at £700-900. This 3in (8cm) Quatre Soleils scent bottle and stopper, designed in 1912, is “more intricately made than Lalique’s mass-produced bottles,” says Oliver. A Lalique 'Quatre Soleils' scent bottle estimated at £5000-7000. This very rare opalescent Chrysis car mascot, designed in 1931, “captures something of the Art Nouveau period but with the drama of Art Deco,” says Oliver. A Lalique Chrysis car mascot estimated at £30,000-50,000.